Society is increasingly concerned over water quality. The means by which this is maintained and enhanced while growing an economy is a major challenge for governments in many places. Here I introduce some underlying concepts around water quality that Waiology followers will need to appreciate when they look at the forthcoming series of blogs. “Good” water quality depends on what the water is for (B. Diggles). Rather than just being a set of defined scientific numbers, water quality is rather a perception defined by communities and it varies from place to place and between communities. What is seen as poor water quality by some may be adequate for others. Generally however, good quality is usually recognized as water that is safely drinkable, swimmable and from where food may be gathered and that provides for community spiritual and cultural needs and for healthy ecosystems. Is good water quality ‘natural’ water? Not necessarily. Waters fed by geothermal springs may have high concentrations of toxic metals, such a Mercury and Arsenic, and may not be drinkable, nor can food be gathered from them yet they are perfectly natural. Do we want ‘pure water’? Pure water with no chemicals in it running through a landscape would not only be impossible it would support very little life. At the other extreme, pollutants are chemicals added to water by man’s activities in amounts that cause problems. Suspended sediments: soil and ground up rock that smothers riverbeds and estuaries and discolours water. Nutrients (nitrogen, phosphorus): encourage excess plant growth, algal blooms. Faecal microbes: affect human, and often animal, health. Toxic heavy metals: from urban runoff and industry that may poison freshwater life. Agri-chemicals and Industrial organic substances: such as herbicides and pesticides. Emerging contaminants: include compounds such as pharmaceuticals (hormones, drugs) that affect life cycles of freshwater organisms. Water quality and water quantity are closely linked. When river flows are low, pollutants have a greater impact as they may then be concentrated and, when river flows are high, pollutants maybe transported in greater amounts (loads) but in a more dilute form. However, high flows that transport (say) sediments will have a greater impact on downstream receiving waters bodies such as estuaries when those loads are deposited. 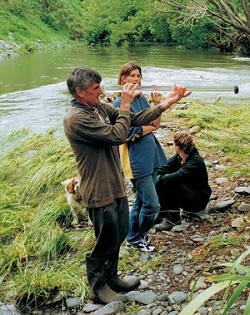 NIWA field staff using a clarity tube to assess water quality (A. Blacklock). Communities and individuals become concerned when water quality changes, so a time-series of measurements is needed to assess change. 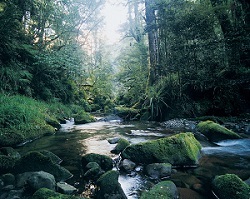 In a recent analysis of river water quality in New Zealand, urban areas were identified as having poorer water quality than rural areas, and farmland generally had poorer water quality than forests. How was this measured? Agencies responsible for environmental protection, science and state of the environment reporting have water quality monitoring sites in their areas of interest. In New Zealand, Regional Councils and NIWA have provided information from approximately 1000 sites as will be described in the next blog in this series. Sediment and nutrient concentrations and faecal microbes have been measured in many of these as have water temperature and dissolved oxygen. How can we manage water quality? There are many ways to do this but there is no single solution that will work on all pollutants in all places at all times. There are two major groups of sources of pollutants that affect water quality – ‘point sources’ from single identifiable points such as an end-of-pipe, and ‘diffuse sources’ where pollutants come from many small and widespread points such as run-off from a series of farm paddocks, or seeps in groundwater. While policy has been effective in controlling point sources, diffuse sources are the most difficult to manage. Water quality resulting from diffuse sources may be managed at three levels: Individuals (including farms, industrial sites) that put in place measures such as waste treatment, riparian protection or better land management; Industry collectives (eg the dairy industry) that put in place rules for their constituents to encourage good land management practices; and policy agencies that put in place rules preventing pollution and encouraging good management by providing guidance. In this series of blogs in Waiology you will be reading about the pollutants and these approaches. Dr Clive Howard-Williams is the Chief Scientist for Freshwater and Estuaries at NIWA. Question. Is a townie washing dirt off the car or over fertilising the vege garden or lawn, point source or diffuse?